Who out there likes grapefruit? Like a lot? At our house, we love it, but my husband especially loves. Then a few years ago I discovered a grapefruit gumdrop recipe. 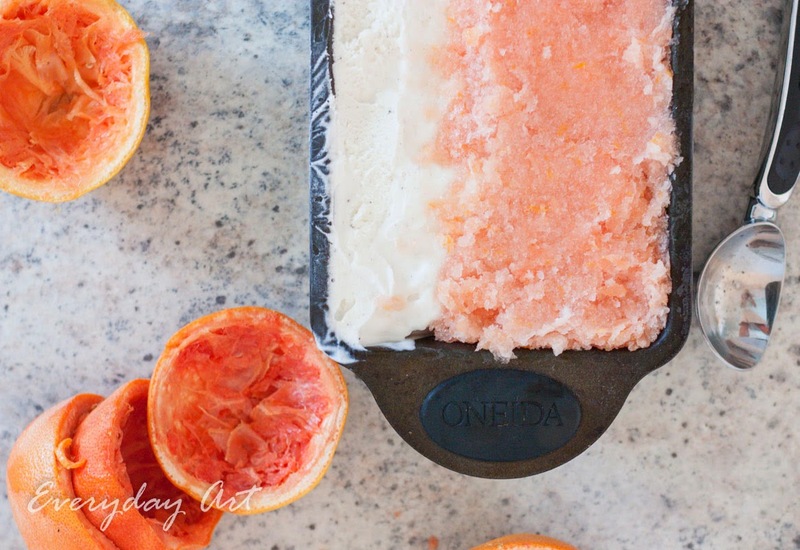 So, when I was brainstorming and surfing the 'net trying to find a good Father's Day dessert that would satisfy my hubby and my father-in-law AND would be gluten-free, egg-free, soy-free, and nut free to accommodate everyone else, you can imagine my joy when I came across this recipe for Grapefruit Creamsicle ice cream! yay! 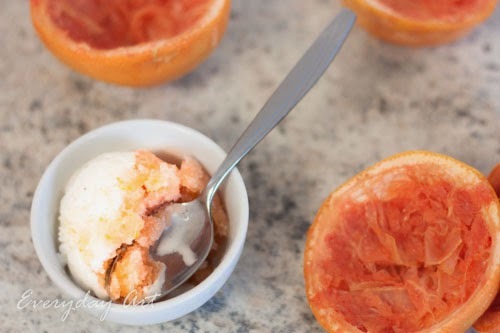 grapefruit heaven for sure! In all honesty, I thought the recipe sounded a little wonky (hibiscus tea bags?) so I read a few grapefruit sorbet recipes, which varied a surprising amount, and got a good feel for what needed to be done. Just in case though, I browsed for some hibiscus herbal tea during my trip to the grocery store--wasn't too surprised I couldn't find any. 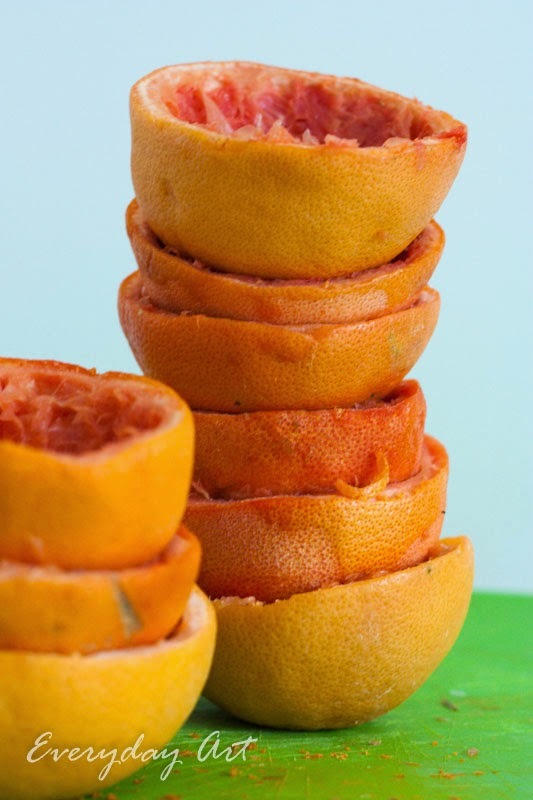 Then it was game time--time to start juicing and zesting grapefruits! This recipe is a great make-ahead dessert for get-togethers. I made it the day before and then it was ready to go at dessert time without any hassle. perfect. 1. Scoop the vanilla ice cream into a loaf pan. Pack it along one side to fill half of the pan. Cover and freeze until firm, about one hour. 2. Combine the water and sugar in a saucepan. Bring to a boil to dissolve the sugar. Remove from heat and add the tea bags and zest. Let steep 10 minutes. Discard the tea bags and stir in the grapefruit juice. 3. 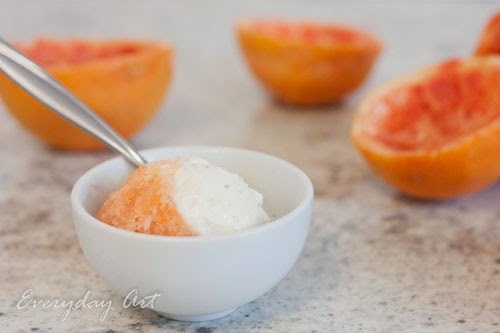 Now you can either process the grapefruit juice mixture in an ice cream maker, or you can simply put it in a bowl in the freezer and remember to stir it every half hour or so as it freezes. It will be more crystal-y this way, but that is how I did it and everyone thought it was wonderful. 4. When it is frozen, scoop it into the loaf pan alongside the vanilla ice cream (you will likely have leftovers, oh darn). Cover and freeze until firm, a few hours. If you need Hibiscus, I have some extra from this: http://homemadesodaexpert.blogspot.com/2013/08/recipe-28-jamaica-sunrise.html or pick up some powdered Jamaica mix in the Hispanic foods section. I found some dried hibiscus among the mexican spices at a kroger one time. You might find some there. I think Tazo Passion is mostly hibiscus, though I could be wrong. Also look by the supplements, not just the teas. It will add some good color, but there will be some floral flavor to it as well. Just the other day I was thinking I should make grapefruit creamsicles. So thanks! This will be perfect!